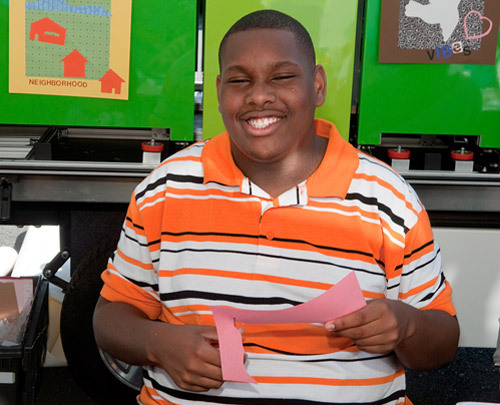 Kharyshi Wiginton is the Youth Leadership Coordinator at McClymonds Youth and Family Center. Wiginton and her students are prominently featured in the “We Dream in Art” mural on view at OMCA until 2015. YOLO, short for Youth Organizing and Leadership Opportunities—and a play on the hip-hop motto “you only live once”—is an initiative from Alternatives in Action, run out of the McClymonds Youth and Family Center that has developed a reputation on campus for using the power of students’ creativity to tackle the school’s struggles. YOLO is now in the early planning stages for an educational photo campaign to address issues of drugs, violence, and dysfunction, according to Kharyshi Wiginton, the Center’s Youth Leadership Coordinator. Students at the McClymonds Youth and Family Center make paper quilts in collaboration with the Museum for the "We Dream in Art" mural. Wiginton is a dancer, educator, and a magnetic presence at the Center. After school, students cluster around her desk, jockeying for her attention. The affection is clearly reciprocated. Originally from Pomona in Southern California, Wiginton identifies as a transplant who has found her home in West Oakland. McClymonds is “a gem,” she said, for its legacy of social justice, activism, and its students’ kindness. 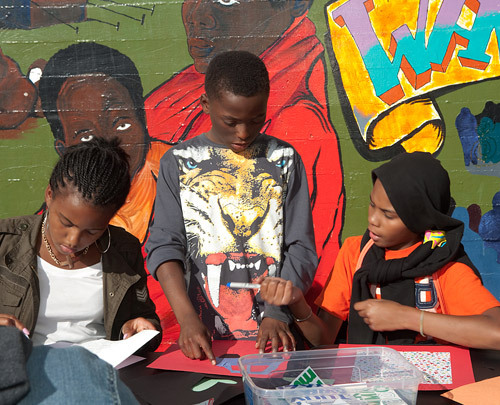 West Oakland’s legacy of social justice activism inspires Wiginton and her students to develop innovative programs such as YOLO and Culture Keepers, a tier-mentoring program that fosters discussions about identity. She emphasized that McClymonds is a Black Panther school and West Oakland a Panther neighborhood, the home of pioneering free lunch programs at schools and for neighborhood women and children. 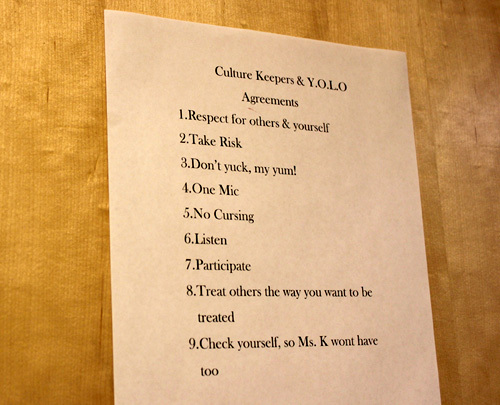 A list of agreements posted on Kharyhi’s office door set the tone for the Center. Wiginton’s work ethic is rooted in a simple, yet novel idea for education: school is more than what occurs in the classroom. And as the only public high school in West Oakland, McClymonds embraces the community school model. “Kids don’t exist in a box, so when I come into the classroom, if my family is homeless, if I haven’t eaten, if my parents are on drugs, or if I’m struggling with self-esteem or being bullied or whatever those things are, they come into the classroom as well,” she said. 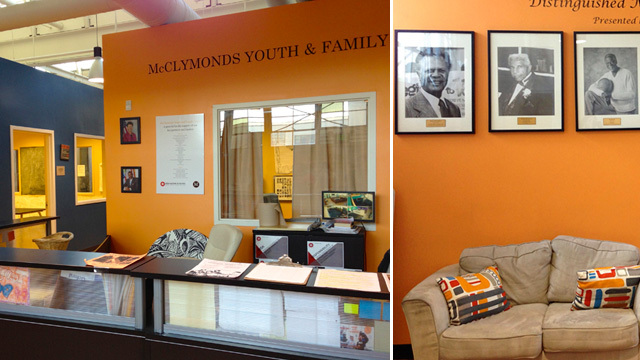 McClymond High School's Youth and Family Center. In addition to hosting youth organizing activities, the Center, operates as a bridge between students’ lives in and outside of the classroom. Founded in 2011, the Center is a product of a ten-year process between the community, McClymonds Alumni, service providers, and funders. It is a direct accomplishment of the Oakland Unified School District’s attempt to transform its schools into full-service community schools. Furnished with plush couches, warm colors, and framed photos of McClymonds alumni, the Center indeed feels more like a living room than a typical high school classroom. It also houses two full time care managers and a parent coordinator, which provides another source of refuge for students. A student at the McClymonds Youth and Family Center adds his contribution to OMCA's "We Dream in Art" project. By inviting and encouraging young people to discuss their identities, Wiginton encourages them to develop a holistic view of themselves as part of a larger community.